Merrion Square in central Dublin is not far from Trinity College. One of Dublin’s famous blocks of Georgian homes, Merrion Square was once the stomping grounds of many prominent Irishmen, including the poet W.B. Yeats at No. 82, and straight across, at No. 1, the childhood home of Oscar Wilde. 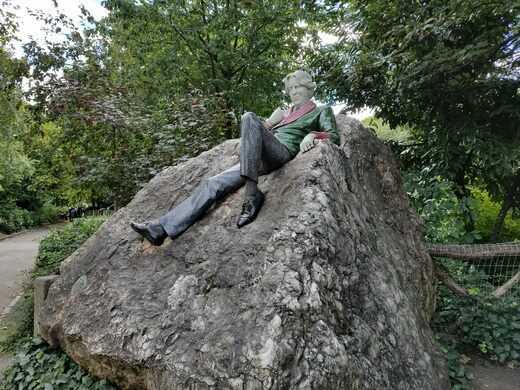 Wilde now lounges just inside the park, on a boulder of white quartz, sculpted from a colorful assemblage of polished granite and semi-precious stones. A devastating booze inferno poured through the streets, claiming only the victims dumb enough to drink it. 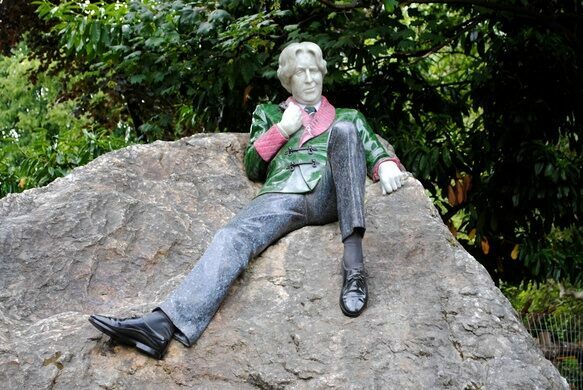 The sculpture of Wilde was commissioned in 1997 by the Guinness Ireland Group (yes, that Guinness) to commemorate one of Ireland’s most famous sons. 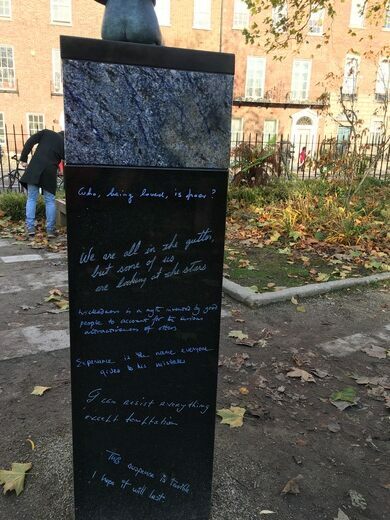 A site in Merrion Square Park was chosen, and now the stone Wilde, in relaxed repose, looks straight out at his boyhood home where he grew up the son of the renowned surgeon and Irish folklorist Sir William Wilde. The colors and textures of the statue come as a bit of a surprise, with a jacket carved from deep green nephrite jade, collared in bright pink Norwegian thulite. His trousers are fashioned from sparkling blue pearl granite, with shoes that seem to be spit-shined from polished black granite. His face might seem a bit of a puzzle until you consider the intention of the sculptor, Danny Osborne, whose goal was to capture what he sees as the dual nature of Wilde – at once joyous and somber, both comedy and tragedy – looks that are captured on opposite sides of the face. 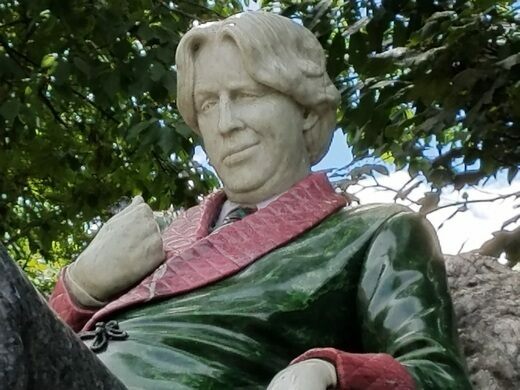 The life-size statue of Wilde is flanked by two smaller bronzes, both atop polished granite plinths engraved with quotes from Wilde’s work. The first bronze is Osborne’s image of Wilde’s pregnant wife, Constance, and the second is his interpretation of Dionysus, the Greek god of the vine and the theater, by means of a simple male torso. Wilde lived most of his adult life in England, and he died and is buried in Paris – but he is one in a long and storied line of writers whose spirits are deeply rooted in Ireland. Here, in the center of Dublin, he can rest at home.